Talk all you want about Brad Davis. Dude here is busy wrecking it. If you're unfamiliar, this represents my tactical counterpoint to a similar piece I wrote about the Galaxy earlier this week here. Now we walk on the orange side of life. Welcome to Texas. You can talk about this game being #8v9, as a popular and subversively derisive Twitter hashtag has of late, but LA doesn't necessarily fit into that narrative. After a start that would've made Chivas' ownership team blush, the defending champs have looked the part the last three months, and those who doubted they'd be back in prime form by August were scarce. This is Bruce Arena's Galaxy, after all, and the Postseason Wizard has been brewing a cauldron of cohesive soccer since time immemorial. The Galaxy are our Galacticos and they, despite whatever hiccups we allowed them, belong here. But Houston? Dynamo fans, despite everything, are still playing up the role of the jilted lover in this equation. Toward the conclusion (if there really was one) of the aforementioned writer's righteous diatribe, which was rife with indignation and "How-could-theys," he makes the following statement: "But you know what Brad is right. I don't care if the media thinks we are an amazing team I know we are." I don't care? The previous 600 words beg to differ. The previous year begs to differ. In several senses, Houston is the anti-LA. No flash, little sizzle, less national attention. Houston's big signing was Boniek Garcia, who has been outstanding since joining MLS but who, naturally, did not draw the same national attention that, say, Keano or even Edson Buddle did. This makes sense to perhaps all of us except the intensely hot core of the Dynamo's supporter's group. It certainly makes sense to me, but then again, a Dynamo fan I am not. But let's get serious. Even teams within LA's AIG family need to look for Black Friday deals instead of paying wholesale for the most expensive items, and Houston (along with clubs like RSL) have been among the league's best at finding the best deals from the furthest corners for the lowest prices. Hello Fabian Espindola. Hello Boniek Garcia. Anyway, enough with the Dr. Phil stuff. You came here for analysis, so let's hop to it, gents. It is difficult to make any comparisons to last year's final where Houston is concerned because only one holdover from last year's midfield, Adam Moffat, will start on Sunday. As you'll recall, Brad Davis tore a quad in the conference final last year and missed the cup. Without their provider, the Dynamo advanced line sleepwalked through 90 minutes of mostly uninspired forays forward. Moffat had one chance on goal that went begging, though that was more or less it. So we have to look elsewhere, in the process kneecapping any comparisons to the 2011 final and taking this one on its own legs. And the Dynamo have some new wrinkles to present to the Galaxy, who lost a 2-1 decision at Houston in May in the only meeting between these teams this year. The date of that game rules out a lot of relevant analysis. LA was without Donovan and Keane, both of whom were out on international duty, and the Galaxy were in the midst of a spiral that seems worlds away now. So look to the immediate past we shall. As he's done capably throughout the playoffs, Moffat will hold space in Houston's end while the cavalry line of Brad Davis, Boniek Garcia and Rico Clark stampede forward. Clark has missed time but will be probably be back in place of Camargo, who's done yeoman's work this season. Davis will cross from the left, Garcia will dance through tackles on the right and Clark will buttress both and provide a link between Moffat and the rest. So we know the principals are different, but what has that done to Houston's play going forward? How has it evolved? And has it been wholly positive? This postseason, the Dynamo have scored six of their eight playoff goals on run-of-play movements, a far cry from an attack that was almost entirely reliant on the dead ball in 2011. Much of this has to do with Garcia, who has to my eyes been the most valuable midseason pickup in the league. That said, Houston developed into, without doubt, the most dangerous team in the league from set pieces. 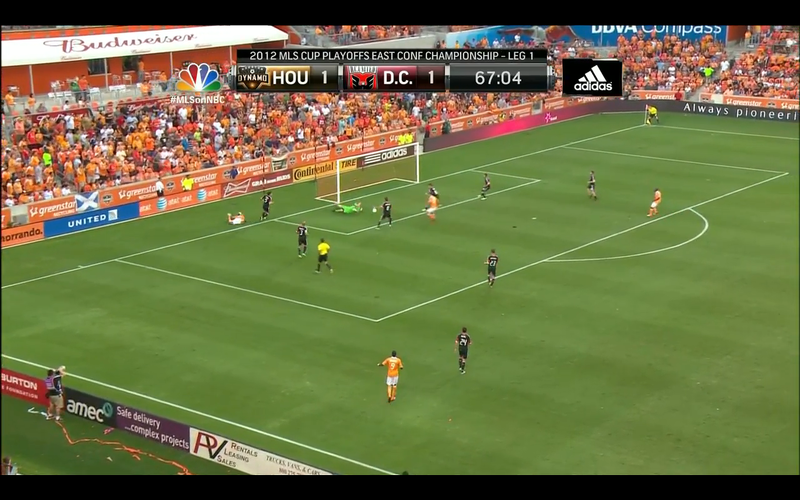 Houston's first goal against DC in the first leg (remember, that's our core sample for our purposes here) was a brilliantly worked quickly taken free kick that, surprise surprise, freed up Garcia on the left for a pinpoint cross that found Hainault and then the net. So this is Houston's baseline, what they do at their most comfortable and what LA knows to be their most well-worn trope. To here, a bunny cross that Bill Hamid spilled into Will Bruin's path. And Bruin is always in the appropriate path when there is one to be had. Always. So the Hooverman scored. 2-1. The third goal, the ostensible back-breaker, was a deft cross-box shot that Kofi Sarkodie splashed into the far opposite netting after cleaning up the mess following a corner from Brad Davis. There is not quite as much to dissect here from Houston's fluidity because they have been far harder to peg as a unit than has LA. There are times when Houston looks as though they will concede possession and bludgeon teams with out-of-the-run free kicks, though these occasions are less than they used to be. And there are times when Garcia looks irrepressible and Houston plays a lovely, flowing, possession-based brand that looks something like what we saw here. And this is becoming more and more the case, and that should worry the Galaxy. What Houston will do is likely this. The Dynamo will probably come out in a 4-4-2, but it will only be nominally thus. I think it will look more like a lopsided diamond, a kind of 4-1-3-2, with Carr dropping a bit deeper and playing almost like a trequartista in lieu of Clark stepping up into a true #10 role, where he isn't as comfortable. 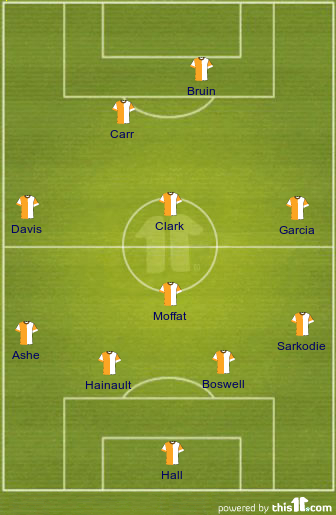 That will free up the flanks while Clark, who could easily drop back onto a shelf to make it a 4-2-3-1, and Moffat gum up the space where Beckham will want to jam in his battle standard and set up his war tent. I think most Houston fans will rather see Carr than Kandji in this space under Bruin, because Kandji is sinfully wasteful with the plethora of chances he creates for himself. He is the definition of a late-game sub in this case who will run at tiring defenders. Otherwise Juninho will slip him into his back pocket and make all of his chances purely speculative. He is not the kind of player who, if I'm Sir Dom, I'd like opposite a fresh LA back line, which is not particularly quick later in games. With both teams more or less defined (though as I mentioned, Houston makes it hard on opponents to do this, which is one of the Dynamo's most iron-backed strengths), I think it's easier to see how this plays out and the matchups that will decide this thing. Sean Franklin will be less inclined to burn down the left with Davis as his assignment and Beckham and Rico Clark will probably have more than one hilariously hyperbolic post-challenge stare-downs. But I think the real mano-a-mano battle to watch is how Adam Moffat fares. This will decide things. Moffat has an enormous task ahead, and if he falters and forces the Houston midfield to sag back for aid, the battle is already lost. For Houston to win this game — not an impossible task by any means but an unlikely one, yes — Moffat has to efficiently limit Robbie Keane's chances enough to release Houston's healed midfield. This is educated conjecture. Uncle Dom (that's three different Dom nicknames squeezed in here — preach) is so good because he will show you what you expect and then do something strange with it. Houston's best-case is that Moffat succeeds in his task, Clark is unshackled, the flanks are unburdened and Bruin is at his poaching best. Something tells me LA will have something to do with that. Houston will probably have a few surprises for all of us this weekend, but the best news? Whatever the Dynamo produce, it will be closer to Manchester than Stoke in the City Scale. Strap in. We're in for some fun. Really nice write-up here, Phil. Happy to be attending the game on Saturday - my other MLS game I got to go to this season (I live in AZ) was Dynamo-Galaxy in May...a hot day at the BBVA. I'm looking forward to this one being a much more active game. Hahaha I meant "Will," yet typed "Phil" again. Let Saturday come!